high quality automatic mushroom growing bag fill manufacturers,high quality automatic mushroom growing bag fill exporters,high quality automatic mushroom growing bag fill suppliers,high quality automatic mushroom growing bag fill OEM service. 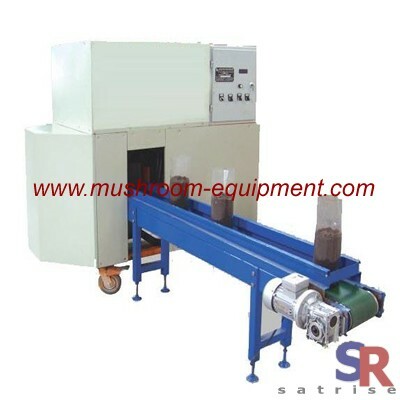 This automatic mushroom bagging machine adopts the advanced electromagnetic clutch, and choose electric control switch, improved charging elastic brake control system. It can working without hurting bags. The length of this machine is adjustable, bagging tightness is adjustable, Bagging specification is adjustable bags. Bag mouth folding diameter 15-23 cm, bag length 10-63cm. This machine is designed exquisite, well-made and has rapid bagging speed, long working life. For spiral push feeding type, the feeding volume can be adjusted according to users’ needs, filling in densely and evenly, working smoothly, saving time and energy.